Its a given that many people are unable to fully switch to Google Slides for their presentations due to some limitations in design capabilities, or even due to client/corporate guidelines. Recently my wife had to present one over hangouts to a new client, and it was not a success. Thanks to the help of +Michael Daniels and +Andrew Hatchett from the User2User Live! 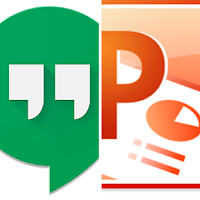 G+ Community, my wife can now present PPT properly over Hangouts. So, here I am to provide you all with the how to so you can be successful with PPT presentations over Hangouts. Normally, when you present a PPT with all its animations, it takes up the full screen and makes it difficult (or near impossible) to start the screen share process. 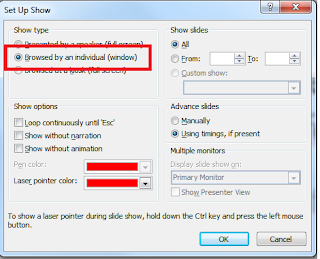 In order to get around this issue, first thing you should do is change the slideshow settings in PowerPoint to display the presentation in a window instead of full screen. Do this by clicking on the Set Up Slide Show icon in the menu ribbon as shown below. That will provide you with the popup options seen here. Click on Browsed by and individual (window) and then click OK. Now you can share the appropriate screen from within Hangouts and still be able to access any and all of the controls you need. Pretty snazzy fix, don't you think? Since I've tried ppt I left attempts to find any other app of that kind for good. I can't get why do people want to change something that works fine. PPT provides me all stuff I require. Only stuff what I downloaded to extend my PPT opportunities was templates from http://www.poweredtemplate.com/ppt-powerpoint-design-templates.html and now I'm totaly fine with presentations.